From New York on 25th October 1794, SARAH LIVINGSTON JAY wrote to her husband John, who was in London negotiating what came to be called the Jay Treaty, about their daughter Maria’s acceptance to the Bethlehem Academy in Pennsylvania. Organized and operated by Moravians, it was one of the few schools of higher learning for girls in the United States at that time. Sarah Jay was used to making decisions on her own when her husband was away and when Maria who was twelve years old asked to attend the Academy Sarah, with the help of friends and relatives, managed to get her admitted. Sarah’s sister Susan had recently married Judge John Cleves Symmes [see posts here and here] and it was in part through his influence that Maria was accepted. It was in the couple’s custody that Maria traveled to Bethlehem. . . . . Last Saturday our dear little Maria went with Judge Symmes & his daughter to Morris-Town where Mrs. Symmes is, to go from thence with them in their Cochee as far as Bethlehem. In my last I inform’d you how very desirous she was of residing there 12 or 18 months as the means of promoting her Education. As we were inform’d that the school was full & that numbers had applied for admittance without obtaining it; I did not expect that she would be gratifyed; but Judge Symmes was of a different opinion; and as he was not ready for his journey when Mr. & Mrs. Arden went upon a visit to their daughters; he requested them to take charge of a letter from him to the Clergy-man there, which they did, & they have return’d; & Mrs. Arden call’d upon me to inform me that Mr. Van Vleck, the principal of the Society told her that the Clergyman told him that they could not hesitate about the reply, for that the Society were under obligations to Judge Symmes for past favors which ought never to be obliterated, & to the chief Justice of the U. States [John Jay] for past & present exertions for the Welfare of the Union; & that therefore his family merited the Assistance of those who were capable of being useful to them. 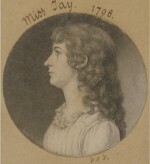 As Mrs. A[rden] was very desirous of Maria’s being there, she was kind enough to impress them with a favorable opinion of her understanding, representing her as a young Lady that was willing to forego the indulgences her situation in Life afforded, merely to derive advantage from retirement & application. She has acquired great éclat among her friends here likewise who know it to be her own choice. May a kind Providence be propitious to her laudable endeavors to excel. Little Ann [the Jays’ younger daughter] is very industrious at home. I did not wish her to accompany her sister, but if I had, she could not have been prevail’d upon to quit me. She is setting by me studying her french. The Children all behave well, enjoy perfect health & are very chearful. Yourself & Peter [Peter Augustus, the eldest of the Jay children who had accompanied his father to London] are the constant theme of our conversation. . . . 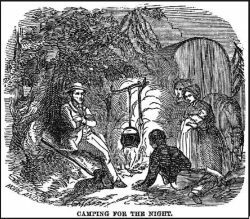 Selected Letters of John Jay and Sarah Livingston Jay, compiled and edited by Landa M. Freeman, Louise V. North, and Janet M. Wedge (Jefferson, NC: McFarland & Company, 2005), 236. The portrait of Maria, dated 1798, is by Charles Balthazar Julien Févret de Saint-Mémin and is in the National Portrait Gallery of the Smithsonian Institution. 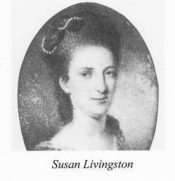 SUSAN LIVINGSTON SYMMES had written a letter to her husband-to-be in 1794 before their marriage referring to the state of her finances and her intention to repay her sister Kitty for money she had borrowed. Feby 10– Baltimore 94Permit me my friend once more to intrude upon your patience & waste so much of your time as to endeavor to clear myself of the heavy charges brought against me in your letter of the 4th february. John Cleves Symmes tried to use Susan’s letter to assert his claim that she had given him control of her finances and did not have the authority to repay her sister. He failed. 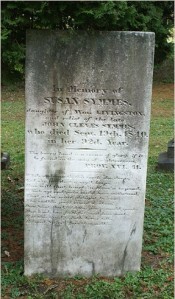 In 1808, after living several years in Ohio, Susan Livingston Symmes left her husband and returned to the East. Although she did not divorce him she lived apart from him in New York until his death in 1814. Susan died in 1840 and is buried in Stockbridge, New York, in what is known as the Sedgwick Pie. It gets its name from its shape and layout. The family patriarch, Theodore Sedgwick, and his wife lie in the center; family members, relatives, servants, pets, etc. are arranged in concentric circles around him. American Women Writers to 1800, Sharon M. Harris – editor, (New York: Oxford University Press,1996), 92-94.